Jak Heath.com: Great Impressions and RC Blog Hop! The Ribbon Carousel Crewmates are teaming up with the talented designers from Great Impressions to bring you a blog hop overflowing with crafty goodness! We got to play some super fun stamps from Great Impressions AND some ribbon and twine from the Ribbon Carousel, of course! I used Pan Pastels to colour, papers from my stash, Memory box dies and a pretty stick pin. Hop along with us today and leave some blog love for our Ribbon Carousel Crewmates and the The Great Impressions DT to be eligible to win one of the 2 prizes up for grabs! We'll select 2 random commenters from 2 randomly selected designer blog, so be sure to spread the love around! 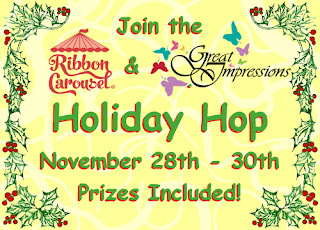 The Great Impressions prize is a $25 Gift Certificate, and the RC prize is a $25 Gift Certificate to the RC store! Gorgeous card, Jak! I think I have that designer paper too. Very pretty! This card is just brimming with delicious-ness :) All the extra little touches really make your card - love it Jak! Gorgeous card, Jak! Love all of the different elements and what you have done with them. I think that Great Impressions sentiment stamp is one of the best I've ever seen. I love the trees, too. There's just something strong and peaceful about a tree. 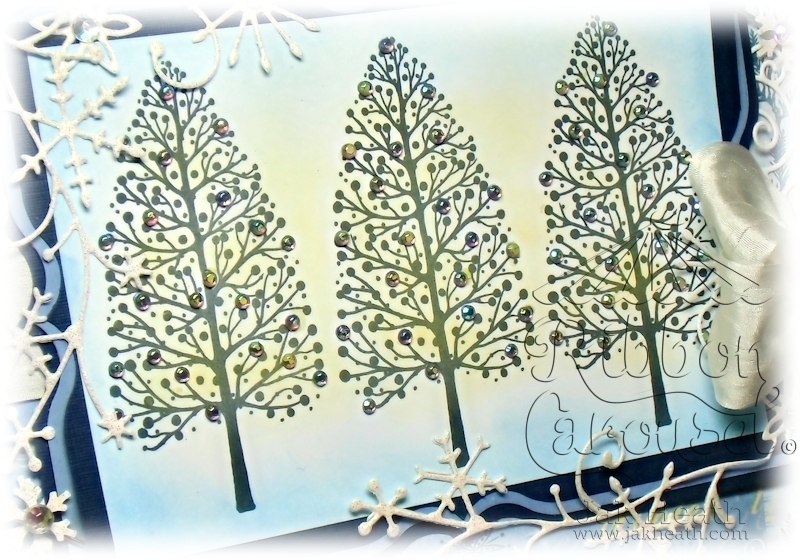 What a gorgeous card, just love the stamp, and you've made such a lovely Christmas card with a modern style to it. Absolutely gorgeous! I'm loving this stamp. I may have to pick one up. Wow!! Jak, your card is stunning!! Thank you for a fun hop!! Beautiful and elegant - lovely trees and very pretty ribbon! I love the shades of blues! I love your coloring with the Pan Pastels-I have heard of them, but have never seen them anywhere. So pretty! I am loving that tree stamp and how you accented the trees! Love the yellow with the blue p great pop of color! Such a pretty card, Jak! Great job with the trees. I love the blues amazing job. Blue and white makes such a pretty Christmas card. Your card has so many gorgeous elements, the die cut swirls of snow, the curliques on the sides, a beautiful white bow, pins and pearls, all complimenting the tree image. Love it all! Fabulous card--I like all the dies you used. Glitter and silk-what could be better!! 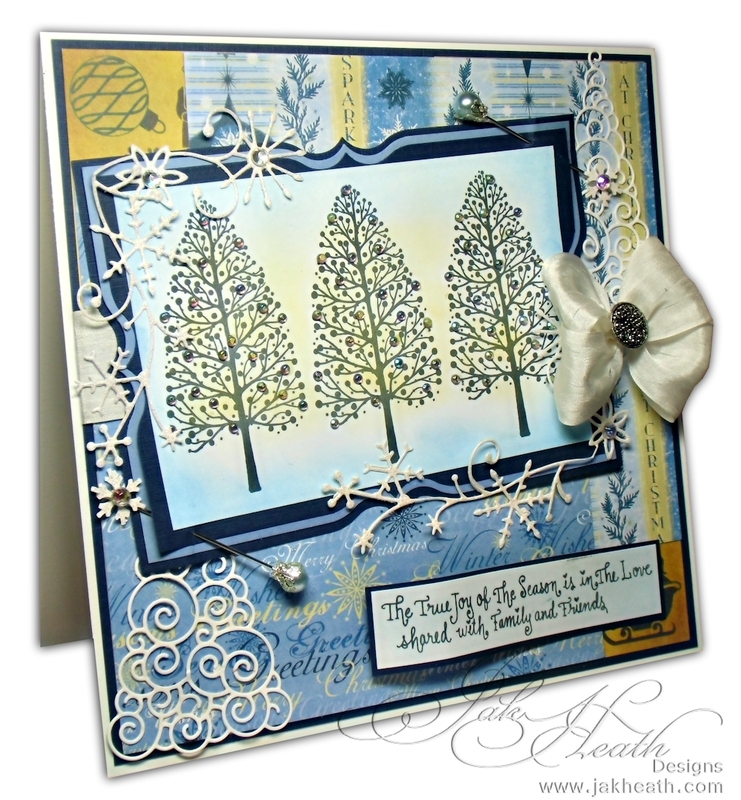 Such a pretty winter tree scene shown off by the white silk bow! So fun to hop with your team Jak! Such a lovely card! I love all the wonderful elements! Wow...this is gorgeous. Wonderful details. Jak, all I can say is "WOW". Took my breath away with all it's color & shine. Great ideas! Lovely card! Love the details with the pretty dies! The bow adds such a nice touch of elegance. Thanks for sharing. GORGEOUS card, love the layers and the shading. The trees are beautiful and such a great choice of DP's! VERY well done! Love your wintry scene. It's gorgeous! LOVE your gorgeous card! Your ribbon bow is beautiful & I love the die cuts, too! Beautiful card! Love your colors goes great with the ribbon and tree stamp! Love it!! Love your beautiful card and layers of gorgeousness! Gorgeous card Jak and i too have that designer backing paper.